Manners, morals, and common sense are all cleverly commented on with excerpts from Beatrix Potter's original tales. Excerpts from Beatrix Potter's original tales, along with the original illustrations, are brilliantly teamed with frank and witty advice. This Extra Large Peter Rabbit soft toy is even more huggable than the last. Peter Rabbit has been made from beautifully soft fabric and has been dressed in clothing exactly as illustrated by Beatrix Potter, with his signature blue jacket. The Peter Rabbit collection features the much loved characters from the Beatrix Potter books and this quality and authentic soft toy is sure to be adored for many years to come. Size:• Height 38cm• Width 30cm• Depth 30cmThis product is suitable from age 1+, hand washable and CE marked. Beatrix Potter Peter Rabbit Organic Snack Box with Cutlery Set Brighten up a back to school packed lunch with this adorable Peter Rabbit organic snack box and cutlery set. This little snack box is the perfect size for a sandwich or a healthy fruit snack. Dishwasher safe. Not recommended for microwave use. Presented in a branded gift box H 6.5cm W 18cm D 6.5cm Ideal to keep your little ones happy when out and about, on day trips or for a family picnic. Makes perfect gifts for children, or even christening gifts. Suitable for ages 18 months+ Snack box lid is not leak proof. Avoid use with liquid foods. This beautiful Peter Rabbit Musical Cot Mobile features four characters from the original tales of Beatrix Potter; Peter Rabbit, Flopsy Bunny, Benjamin Bunny and Cotton Tail hang from a circular fabric mobile with cute \"Sleep tight little bunny\" wording.This mobile has a traditional wind up music box and the characters rotate gently as it plays a soothing lullaby. It is easy to assemble and the plastic arm can be adjusted to fit securely between the bars of the cot.The Peter Rabbit Musical Cot Mobile is ideal for children aged from birth to 6 months. A lovely xylophone in the shape of Jemima Puddle-Duck from Peter Rabbit which comes with 2 drumsticks that are perfect for little hands to grasp and make music! Part of TY\'s amazing Peter Rabbit range, the TY Peter Rabbit Beanie is instantly recognisable with its brightly coloured, highly tactile, plush fabric. A beautiful collectable soft toy! This is the perfect Peter Rabbit wooden toy for any little fan! Kids will adore playing with this wooden toy train. The wooden Peter Rabbit characters and carriages can be taken apart and re-built and a handy string ensures little one can pull their train around! This Peter Rabbit soft toy is made from beautifully soft fabric and is dressed in clothing exactly as illustrated by Beatrix Potter, with his signature blue jacket. The Peter Rabbit collection features the much loved characters from the Beatrix Potter books and this quality and authentic soft toy is sure to be adored for many years to come. This product is suitable from 12 months of age and above, hand washable and CE marked. This Flopsy soft toy is made from beautifully soft fabric and is dressed in clothing exactly as illustrated by Beatrix Potter, with her signature red cape. The Peter Rabbit collection features the much loved characters from the Beatrix Potter books and this quality and authentic soft toy is sure to be adored for many years to come. This product is suitable from 12 months of age and above, hand washable and CE marked. This Benjamin Bunny soft toy is made from beautifully soft fabric and is dressed in clothing exactly as illustrated by Beatrix Potter, wearing a dusty brown jacket. The Peter Rabbit collection features the much loved characters from the Beatrix Potter books and this quality and authentic soft toy is sure to be adored for many years to come. This product is suitable from 12 months of age and above, hand washable and CE marked. This lovely wooden Peter Rabbit Music Box is the perfect gift. Just wind up the music box, and enjoy watching Peter Rabbit and Flopsy Bunny dance and twirl along to the tune of \"Brahms Lullaby\". A super gift, particularly for any special occasions. A brand new addition to our Peter Rabbit collection. Introduce little ones to numbers 1-10 with this lovely Jemima Puddle-Duck puzzle. Painted in bright colours and printed with clear text, its chunky pieces are just right for small hands to grasp. This adorable my first Peter Rabbit plush is an ideal gift for newborns! Personalise with your choice of name to be printed along the body of the toy. Dimensions: H31 x W20 x D10cm (12¼ x 8 x 4"). Personalisation: Name up to 15 characters. An engaging storybook and toys in one activity kit! My Busy Books offer full-page illustrations, a story, 12 figurines, and a playmat that bring the characters to life and ignite your child's imagination. For children 3 years and over. With pictures of Peter Rabbit, for children to finish and colour, this doodle book provides hours of fun for little artists, encouraging creativity and stirring the imagination. From the classic Beatrix Potter books this beautiful Peter Rabbit Comforter is made from premium soft fabric to ensure he is as gentle against babies skin as can be. As seen in the original illustrations with cute Embroidered facial features and a Peter Rabbit logo motif.The Peter Rabbit Comfort Blanket is Machine washable so can be taken everywhere with your little one and restored to new with a quick wash!Suitable from birth. Packaged in a beautiful box, this wooden Peter Rabbit push along toy is here to help your little one find their feet! This bright push-along pal is hand painted in a gorgeous, colourful design that will have your little one toddling along in no time. They\'ll love the wooden beads clacking at the sides, encouraging them as they make those first steps. Packaged in a beautiful box, this wooden Jemima Puddle-Duck push along toy is here to help your little one find their feet! This bright push-along is hand painted in a gorgeous, colourful design that will have your little one toddling along in no time. They\'ll love the wooden beads clacking at the sides, encouraging them as they make those first steps. This Peter Rabbit soft toy is made from beautifully soft fabric and is dressed in clothing exactly as illustrated by Beatrix Potter, with his signature blue jacket. It comes in a Union Jack Gift Bag. The Peter Rabbit collection features the much loved characters from the Beatrix Potter books and this quality and authentic soft toy is sure to be adored for many years to come. This product is suitable from 12 months of age, is hand washable and CE marked. From the classic Beatrix Potter books this beautiful My First Peter Rabbit Soft Toy is made from premium soft plush to ensure he is as gentle against babies skin as can be. Peter is as seen in the original illustrations and is wearing his signature blue jacket with a cute embroidered radish Motif. Peter has Embroidered facial features a cute Peter Rabbit logo on his foot and is machine washable so makes a perfect as a gift for Newborns or decoration piece for Nursery\'s. 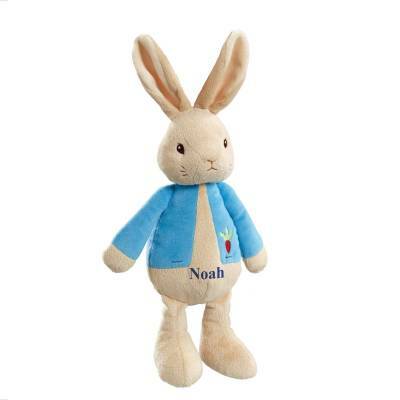 The My First Peter Rabbit Soft Toy is suitable from birth. Rabbits are always very uppity during the Christmas season, and Peter Rabbit was no exception. This Peter Rabbit 3D Puzzle is made up of chunky pieces, perfect for little hands! Peter Rabbit can be pulled apart and put back together, helping to develop a child\'s coordination and motor skills. The pieces are hand painted in non-toxic paint. A set of three puzzles with some of our favourite characters from Peter Rabbit. Each made up of three pieces making it perfect for little hands to grasp and play with. This set can help with colour recognition, fine motor skills as well as developing stories and imagination with the completed characters. Exciting playful characters from the animated Peter Rabbit TV series! From the inspiring and lively re-imagination of Beatrix Potters timeless childrens classic the mischievous, charming and brave Peter Rabbit is a hero who overcomes challenges with his best friends Lily Bobtail and Benjamin Bunny. Peter wears his signature blue jacket whilst Lily wears her pink dress and jacket and Benjamin sports his green ear-muff hat with red pom-pom. Please note: This is an assortment pack. 1 will be supplied and picked at random. Colours and decorations may vary.From the classic Beatrix Potter books these beautiful Peter Rabbit and Flopsy Bunny bean rattles are made from premium soft plush to ensure they are as gentle against babies skin as can be. Peter and Flopsy are as seen in the original illustrations and have cute embroidered detailing. 17cm tall, These soft toys contain a gentle soothing rattle and are machine washable so make perfect gifts for Newborns. Sensory play encourages chidren to enjoy using thier senses. This Peter Rabbit Baby Egg Cup and Spoon by Wedgwood is the perfect addition to any home. Over 250 years of history make Wedgwood a truly iconic English brand. This Peter Rabbit Musical Box by Wedgwood is the perfect addition to any home. Over 250 years of history make Wedgwood a truly iconic English brand. Make friends with this wonderful wooden handcrafted Jemima Puddle-Duck pull along toy from Peter Rabbit. Painted in pink and white, this cute puddle-duck will follow you around as you pull her along. Perfect to encourage those first steps. This Moonlite Individual Peter Rabbit Story Reel features Beatrix Potter The Tale of Peter Rabbit. Insert the story reel into the Moonlite projector; clip it onto your smartphone (not included) and project beautiful and vibrant illustrations onto any surface! Moonlite story reels create an immersive reading experience that instils a love of learning at a young age. As children follow along to their favorite stories, they develop their imagination, creativity and language skills. This pack includes: 1 Story Reel, 1 Activation Card and 1 Quick Start Guide. Part of TY\'s instantly recognisable Beanie Baby range, this collectable soft toy is made from brightly coloured, highly tactile plush fabric  its the perfect addition to any TY Soft Toy collection!The TY Peter Rabbit Flopsy Small Beanie Baby is suitable from birth. Border Fine Arts has been producing The World of Beatrix Potter products since being granted a licence in 1987. Since then, the collection has grown to include many different formats. The artwork for each product is taken from the original illustrations from the Beatrix Potter stories. Presented in a branded gift box, this stunning Peter Rabbit nursery set makes a wonderful gift for a birthday, Christmas or other special occasion.Material: Ceramic.Mug Height: 8cm (3¼"), Bowl Diameter: 17.5cm (6¾"), Plate Diameter: 18.5cm (7¼"). This Peter Rabbit Baby Cup by Wedgwood is the perfect addition to any home. Over 250 years of history make Wedgwood a truly iconic English brand. This Peter Rabbit First Tooth / Curl Box by Wedgwood is the perfect addition to any home. Over 250 years of history make Wedgwood a truly iconic English brand. 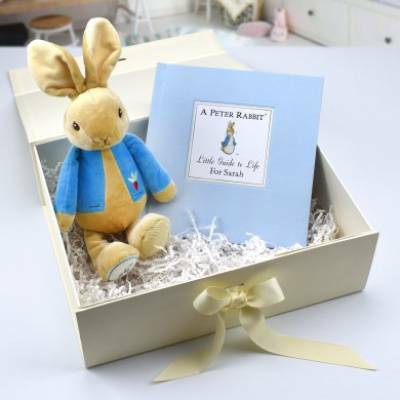 A Peter Rabbit Gift That Gives Twice - Meet another adorable Great Ormond Street Peter Rabbit. This time around we have a Peter Rabbit doctors bag. Perfect for imaginative play, that will provide hours of fun. This Peter Rabbit Doctor's bag includes a small Peter Rabbit, a stethoscope featuring a reflective mirror fabric, a medicine bottle which rattles to create the illusion that it contains tablets, and Finally, the Peter Rabbit Doctor's Bag also contains a blue and yellow thermometer. This Doctor's Bag feature's original artworks created by young patients at a workshop run by the GOSH Arts Programme, GO Create. Our designers have used the patients' artwork and created a colourful, fun fabric featuring carrots and flowers to decorate Peter Rabbit's ears, paws and the lining of the bag. This product is suitable from age 1+, hand washable and CE marked. Peter Rabbit Baby Comforter. From the classic Beatrix Potter books this beautiful Peter Rabbit Comforter is made from premium soft plush to ensure he is as gentle against babies skin as can be. We will embroider your message over 3 lines of 30 characters each including spaces on the white side next to the Peter Rabbit logo. It is machine washable so can be taken everywhere with your little one and restored to new with a quick wash! Dimensions: H: 10cm, W: 30cm and D: 30cm and suitable from birth. Border Fine Arts has been producing The World of Beatrix Potter products since being granted a licence in 1987. Since then, the collection has grown to include many different formats. The artwork for each product is taken from the original illustrations from the Beatrix Potter stories. Presented in a branded box, this stunning money bank has been lovingly hand painted and makes a wonderful gift for a birthday, Christmas or other special occasion.Material: Ceramic.Height: 9cm (3½"). A wonderful Peter Rabbit gift that will bring a smile to your face, any time of the year. This sweet yet traditional calendar has square numbered blocks and rectangular blocks showing a month of the year. Children can also enjoy learning about the days and months of the year, a great gift for all the family. Presented in a branded kraft box. A super cute Peter Rabbit Cushion, just perfect gift for adding a touch of fun to any bedroom or nursery. This cushion is covered in a super-soft velvet like fabric, making them extremely tactile and snuggly, almost like stroking a bunny rabbit. Completed with intricate embroidery and applique detail, this Peter Rabbit Cushion shows the famous rabbit wearing his iconic blue jacket. This item is not intended to be a children's toy. Cover material: 100% Polyester. Filling material: 100% Polyester Fibre. Hand Washable, cold water, mild suds, air dry. A beautifully presented and personalised book of advice teamed with this cuddly Peter plush teddy. A super cute Peter Rabbit Cushion, just perfect gift for adding a touch of fun to any bedroom or nursery. This cushion is covered in a super-soft velvet like fabric, making them extremely tactile and snuggly, almost like stroking a bunny rabbit. Completed with intricate embroidery and applique detail, this Flopsy Cushion shows the famous rabbit wearing her red cape. This item is not intended to be a children's toy. Cover material: 100% Polyester. Filling material: 100% Polyester Fibre. Hand Washable, cold water, mild suds, air dry. Border Fine Arts has been producing The World of Beatrix Potter products since being granted a licence in 1987. Since then. the collection has grown to include many different formats. The artwork for each product is taken from the original illustrations from the Beatrix Potter stories. Presented in a branded gift box, this stunning Peter Rabbit First Tooth and Curl Box makes a wonderful gift for a birthday, Christmas or other special occasion.Material: Ceramic.Height: 3.5cm (1½"). An essential Peter Rabbit Fold Away Tote Bag, Perfect for storing your everyday items. Lightweight and spacious, this bag can be folded for easy storage. The perfect gift for someone who loves all things Peter Rabbit, and the occasional shop. Complete with original illustrations from the Beatrix Potter stories. Founded in 1898, by the eponymous creator Adolph Gund, GUND has gone on to become America's oldest and most prestigious soft toy company. GUND is today known worldwide for its top quality, soft and huggable plush designs. The Peter Rabbit plush collection feature the much loved characters from the Beatrix Potter books. A great gift for fans or collectors of Peter rabbit.This product is suitable from age 1+, hand washable and CE marked. A handy little Peter Rabbit travel set containing our bestselling clean linen toiletries, presented in an adorable branded gift box. This Travel Trio Set is a great travel set for weekends away or sleepovers at a friend's house. Each item is the perfect size to fit into your hand luggage. Containing 1x 100ml Peter Rabbit 2 in 1 shampoo and conditioner, 1x 100ml Peter Rabbit Body Wash, and 1x 100ml Peter Rabbit body butter. Everything you need to wash, soak and moisturize - Mrs.Tiggy-Winkle would be thrilled. This Peter Rabbit 3-Piece Set – Blue by Wedgwood is the perfect addition to any home. Over 250 years of history make Wedgwood a truly iconic English brand. Fill your tub with a relaxing and FUN Peter Rabbit experience. A perfect gift for Peter Rabbit lovers alike. These magical Peter Rabbit bath bombs will create hours of fun for anyone who loves a colourful bubbly moment. This bath bomb boasts clean linen fragrances and turns your water a slight shade of blue. - Just like Peter Rabbit's jacket. Ingredients: sodium Carbonate, Sodium Bicarbonate, Sodium Sulphate, citric acid, Hydroxyethyl cellulose, Parfum, CI 42090, Butylphenyl Methylpropional, Hexyl Cinnamal. Each bath bomb is 100g. Not suitable for children under 5 years of age. This stunning Royal Mint deluxe box containing a Peter Rabbit limited-edition silver Proof 50p coin and book will make a truly fantastic gift for Christenings, Christmas and birthdays. A perfect celebration of Beatrix Potter\'s classic tale, this gorgeous gift is sure to be treasured for years to come. Show them how special they really are. Celebrate a childhood classic with this stunning Personalised Royal Mint deluxe box containing a Peter Rabbit limited-edition silver Proof coin. An amazing gift for a Christening, birthday, Christmas, or for a collector, this beautiful coin will be treasured forever. Personalisations: Name (12 Characters Max.) Message (80 Characters Max.) Please note: This item will be personalised exactly as you have written so please double check spelling, punctuation and use of capital letters. Personalised products can only be returned if they are faulty. Do not include accents and special symbols as some of our processes will not allow this. Due to the font type used please do not use all capitals in your personalised message, or the personalisation will be very difficult to read. Wedgwood is pleased to introduce a range of silver giftware featuring Beatrix Potter\'s iconic character, Peter Rabbit. The simple idylls of childhood evoked through the author\'s tales and enriched with the core values of adventure and outdoor play are illustrated through the characters of Peter Rabbit and his friends. The new Peter Rabbit Silver Plated giftware collection boasts a variety of beautiful gifts to mark special occasions and childhood milestones and presents keepsakes to be treasured for a lifetime. Some of Beatrix Potter\'s most loved characters can all be found within this book. A witty, humorous read that combines passages of text from the Victorian author\'s well-known tales, with sage advice and life lessons. The book will display the recipient\'s name on the top of each page and on the cover; a personal message can also be printed on the opening page. Alongside the book is an adorable Peter Rabbit plush toy, the perfect companion for those bedtime readings. This charming set is presented inside an ivory coloured, deep A4 gift box, making this a truly exceptional and memorable gift that will be treasured by its recipient for years to come. This Peter Rabbit 3-Piece Flopsy, Mopsy & Cottontail Set – Pink by Wedgwood is the perfect addition to any home. Over 250 years of history make Wedgwood a truly iconic English brand. This plate, bowl and mug set features the new Peter Rabbit designs inspired by the classic book illustrations with a leafy border pattern and charming phrases lifted from Beatrix Potter’s story. Peter Rabbit, in his signature blue jacket, is shown on the run with a handful of carrots, jumping over flowerpots and then sleeping soundly against a watering can. Presented in a blue gift box this is a perfect set for new baby, Christening or birthday celebrations. This Peter Rabbit ﻿\'Flopsy, Mopsy and Cotton-tail\' 3-Piece Set by Wedgwood is the perfect addition to any home. Over 250 years of history make Wedgwood a truly iconic English brand. 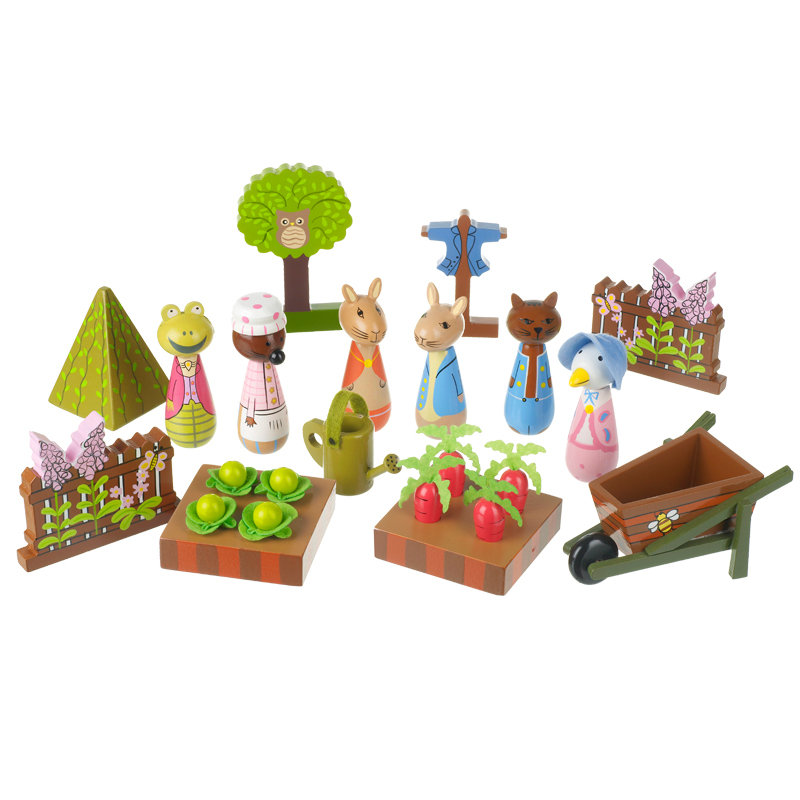 This beautiful play set is based on Mr McGregor\'s garden. With all of your favourite characters to play with, this set is sure to keep your kids entertained for hours. It comes with plenty of different elements for little hands to grasp. A wonderfully, colourful and imaginative traditional wooden toy that will hardly see the inside of the toy box. Made in England, this charming plate features a new Happy Birthday Peter Rabbit border design with the 2019 date. The lovable rabbit himself is running with a clutch of colourful birthday balloons and the caption ‘hip, hip, hooray’. Presented in a specially designed lilac gift box this is an ideal present for a new baby and for christening or birthday celebrations. My First Peter Rabbit with scrummy soft fur are personalised and make a gorgeous gift for Christenings, Easter, Bridesmaid Gifts or New Babies! Peter comes personalised with a engraved hang tag around his little neck tied with a soft satin ribbon in pale blue. We can engrave any message on your tag up to 50 characters per tag, making a personal and perfect gift for kids. This Peter Rabbit 2-Piece Set – Blue by Wedgwood is the perfect addition to any home. Over 250 years of history make Wedgwood a truly iconic English brand. A beautiful glass photo frame with a gold metal framework that\'s just perfect for welcome a new baby to the world! It has a fold out design with exclusive Beatrix Potter illustrations tracking the newborn from birth to their first birthday. It is suitable for four 4x4 inch/ 10x10cm photos and comes in its own sweet yellow gift box each section opening like a book to sandwich the photo in. The frame has a metal stand and is suitable only for display on a flat surface.The Nitty GrittyWhole frame measures (approx) 430x102mm (when fully extended). Treat a little one to their very own Beatrix Potter book, personalised especially for them. Our Peter Rabbit's Little Book Of Virtue features stories and advice from one of the most popular British children's writers. Throughout the book, there are examples from Beatrix Potter’s vast array of stories with advice following. Perfect for a little one's birthday or Christening that will help them learn to be more virtuous and treat people with respect!Personalisation:You can personalise the ‘Little Book Of Virtue’ with a name to appear in up to 12 characters. The name will be printed on the front cover and on the header of each page.You can also add a message to appear in up to 80 characters on the inside cover. 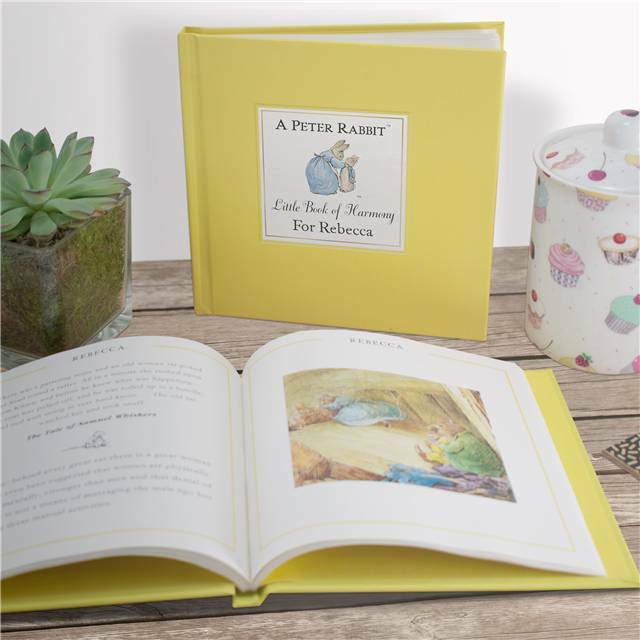 Key Features:Presented in a luxury cream gift box with silver embossing.Your Peter Rabbit book measures 20 x 20cm.Printed on high-quality paper.Hardback cover.Material:Printed on 160gsm high-quality, smooth, satin-finish paper; silk-finish hard cover. This Personalised Peter Rabbit Comforter is made from super snuggly material and features a choice of either Peter or Flopsy to sit atop the blanket. The comforter can even be personalised with text of your choice, making it a special gift to cherish for years to come. This pair of beautiful \'Peter Rabbit\' Book Ends are made from solid wood and make the perfect addition to any child\'s bedroom or playroom. The book ends feature colourful illustrations of Peter rabbit, text from the famous books and can even be personalised with a name of your choice. Excerpts from Beatrix Potters original tales, along with the original illustrations are brilliantly teamed with frank advice to create The Peter Rabbit Little Guide to Life. Manners, morals, entertaining, housekeeping and common sense are all cleverly commented on. Those that love the original tales will enjoy reading the lessons in morals given, and with their name on the reader of each page theyre sure to treasure this thoughtful gift. A personal message can also be included on the opening page, and the book is presented in a beautiful gift box embossed with a Peter Rabbit design. Cherish photos of your little one\'s early years in this beautiful self-adhesive photo album. Featuring illustrations of Beatrix Potter\'s beloved Peter Rabbit character it contains 40 black self-adhesive pages (20 sheets) with each page sized to hold three 6x4 inch / 15x10cm photographs. Simply peel back the transparent self-adhesive overlay position your photo and smooth down. Makes a beautiful new baby or christening gift. The Nitty GrittyMade from paper from responsible sources. Measures (approx) 255x300x45mm. 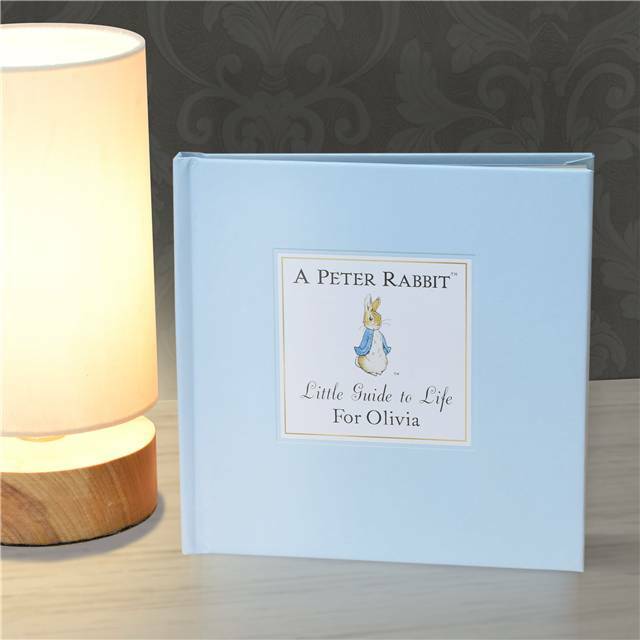 Revisit your favourite memories with your favourite childhood characters with this Peter Rabbit photo album. With Peter Gemima Puddleduck and Squirrel Nutkin - all of your favourites are herePeter Rabbit at PaperchaseTo celebrate Beatrix Potter we’ve produced a wonderful range based on her beloved character Peter Rabbit. Her spellbinding illustrations of the bunny in the blue jacket have inspired generations of readers and continue to find new ones every day.Measures approx. 250 x 300 mm40 acid-free pages Suitable for 4x6 / 10x15 cm photosFits 120 photos 3 per page\"
Buy from Fancypanda Peter Rabbit Deluxe Costume, Blue, with Jumpsuit, Hooded Character Head & Jacket, in Display Bag at a great price. This Peter Rabbit Annual Birthday Plate 2017by Wedgwood is the perfect addition to any home. Over 250 years of history make Wedgwood a truly iconic English brand. This Peter Rabbit Money Box – Blue by Wedgwood is the perfect addition to any home. Over 250 years of history make Wedgwood a truly iconic English brand. This delightful photo album features Beatrix Potter\'s beloved character Peter Rabbit. Made from teal fabric the cover 3 rabbits are beautifully embroidered into along with the words \'Once upon a time...\' and it is embellished with sequins and beads as a lovely finishing touch. Inside there are 50 sheets (100 pages) with a total of 200 slip-in pockets for your photos and the pages have incorporated illustrations from the book series. It comes in a beautiful presentation box making it an ideal gift for new parents a christening or birthday. Suitable for 15x10cm / 6x4 inch photos. The Nitty GrittyMeasures (approx) 226x226x35mm. Building blocks based on the much loved classic, Peter Rabbit. Made from cardboard, so safe for little hands. This Peter Rabbit Mug – Blue by Wedgwood is the perfect addition to any home. Over 250 years of history make Wedgwood a truly iconic English brand. This keepsake money box features a charming new design with Peter Rabbit having to ‘run along home’ with a handful of carrots following his daring escape from Mr McGregor’s garden. Presented in a blue gift box this is perfect for new baby, christening or birthday celebrations. This keepsake money box features a charming new design with Peter Rabbit’s three sister bunnies, Flopsy, Mopsy and Cottontail all fast asleep with butterflies hovering above and a phrase lifted from Beatrix Potter’s classic tale. Presented in a pink gift box this is perfect for new baby, christening or birthday celebrations. This Peter Rabbit Flopsy, Mopsy & Cottontail Mug – Pink by Wedgwood is the perfect addition to any home. Over 250 years of history make Wedgwood a truly iconic English brand. Beautiful gift booties for 0-6 months. These adorable booties are perfect for a new baby gift, either boys or girls. From the ever popular story book of Peter Rabbit they will be a real hit as they are oh so cute! Each bootie also has a little rattle inside so will keep the little angel amused when wearing them. They make the perfect gift for babies, for Christenings or new baby gifts. Suitable age: 12 months +Box HWD: 18 x 18 x 4. 5cm Product HWD: 4. 5 x 4. 5 x 4. 5cm Helps to develop cognitive learning skills like learning the alphabet and counting. A unique gift for all Peter Rabbit fans, who know how to brighten up ANY outfit. Guaranteed to keep you dry, and definitely guaranteed to brighten up any rainy day. We are in love with this beautiful Peter Rabbit travel set. This set contains a blue polka dot passport cover and yellow dotted luggage tag both with Paperchase exclusive Beatrix Potter design. The passport cover has a padded cover with yellow polka dot interior two large pockets and 5 card slots so you can keep all of your important documents safe and sound in one place. The yellow luggage tag has a card for your details and a clear window with a flap to see it. The metal buckle and matching strap attach it securely to your luggage.This Beatrix Potter luggage set will add a touch of elegant nostalgia to your travels and with its gorgeous gift box this set is the perfect gift for a new baby first birthday or any occasion!The Nitty Gritty Passport cover measures approx. 105x 140 mm luggage tag measures approx. 75 x 115 mm gift box measures approx. 195 x20 x 155 mm. This adorable Peter Rabbit backpack is perfect for any little one who\'s already gaining their independence!With a beautiful Paperchase exclusive Beatrix Potter design this backpack two zippable compartments; one large main one which contains another pocket inside for safekeeping and a small front pocket - perfect for snacks bottles and toys! With adjustable shoulder straps and carry-handle on top this bag is perfect for a little one (or a not so little one) for a day out and about!The Nitty Gritty205 x 100 x 220 mm. 100% cotton with PVC coating. Wipe clean with damp cloth. Our childhood favourite hops into life in this Beatrix Potter pattern. This beloved collection is perfect for children and the young at heart alike. The Wedgwood Peter Rabbit nurseryware is made from high quality porcelain. This charming Peter Rabbit design scrapbook has a Paperchase exclusive Beatrix Potter design on the cover. It contains 40 sheets (80 pages) of thick ivory paper so it\'s perfect for making a scrapbook of special moments or just being creative. Try using some of our photocorners to add favourite pictures and get that scrapbook look. The Nitty GrittyMeasures (approx) 255x255x20mm. From the classic Beatrix Potter books this beautiful Flopsy Bunny Comforter is made from premium soft plush to ensure she is as gentle against babies skin as can be. Flopsy Bunny has cute Embroidered facial features and the underneath print contains the Flopsy Bunny logo motif. This comforter is Machine washable so can be taken everywhere with your little one and restored to new with a quick wash! These Peter Rabbit lights are adorable and would make the perfect finishing touch to any celebration. Brighten up your burrow with these cute Paperchase exclusive Beatrix Potter fairy lights.The lights measure approx. 2 m / 6.5 ft long. With this beautiful Paperchase exclusive Beatrix Potter design add a pretty and celebratory finishing touch to your baby shower christening or any celebration.A gorgeous party accessory to welcome baby home! Gorgeous attachable version of a much-loved character. Beatrix Potter fans will love this Peter Rabbit toy, which attaches easily to prams and buggies. Lovely embroidery and beautiful detailing make him a perfect gift for babies. Gorgeous, soft rattles based on Beatrix Potter's best loved characters. Cupcakes and Cookies Look Fantastic When Placed on Top of This Peter Rabbit Cake Stand!This Peter Rabbit cake stand is decorated with a classic vintage stripy style that your guests will love to look at! Made from durable card, this cake stand can be assembled in seconds, and offers a sturdy and strong place to show off your bakes!It matches perfectly with the rest of the Peter Rabbit range, and even more so when you add some themed cake toppers to your cakes! 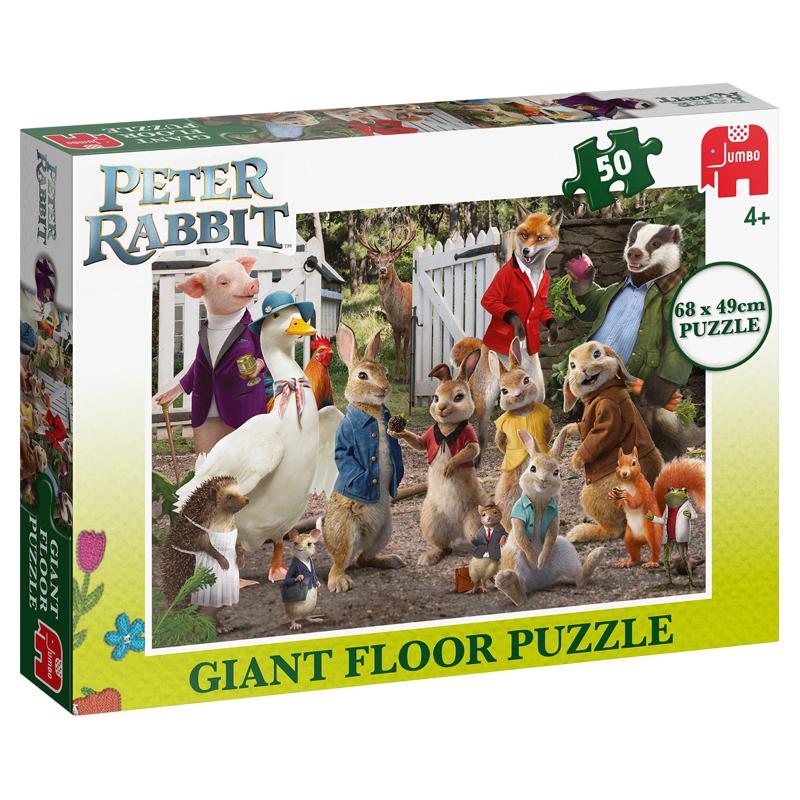 The Peter Rabbit 50 piece Giant Floor Puzzle is a brightly coloured puzzle which is ideal for children to lay out and piece together on the floor. This fantastic floor puzzle features Cotton-tail, Johnny Town Mouse, Pigling Bland, Mrs Tiggy-Winkle, Jeremy Fisher, Jemima Puddle-Duck, Benjamin, Tommy Brock, Flopsy, Mopsy, Mr. Tod, JW, Rooster III, Felic Dâeer, Squirrel Nutkin and everyoneâs favourite Peter Rabbit! The jigsaw puzzle is made up of 50 pieces to help children handle and place each piece together with confidence, so they can complete their giant floor puzzle for future display. Jigsaw puzzles can help children develop their early problem solving and hand-eye coordination from a young age while having fun. The finished 50 piece puzzle measures 68 x 49cm when complete and has been produced using a high quality cardboard to ensure that every piece of the puzzle maintains its original shape time and time again so your child can enjoy this for a long time. This Themed Party Garland Is Covered in Illustrations of Peter Rabbit and Friends!Hang this Peter Rabbit themed garland around your party room to set a wonderful scene! Each flag has a different illustration of Beatrix Potter’s most beloved character, interspersed with paper daffodil and carrot decorations.A fantastic easter theme, or as a theme for fans of Peter and co.
With his sturdy body and soft fur, Peter Rabbit is ready for little ones to cuddle. Add a Vintage Twist to Those Delicious Cupcakes with This Peter Rabbit Cupcake Kit!Create a range of vintage-styled cupcakes with this kit! You’ll find 24 cupcake cases covered in illustrations of Peter Rabbit and friends, and 24 cupcake picks with cutouts of the rest your favourite Beatrix Potter characters.Ideal for a birthday, baby shower, or an afternoon tea with a sweet style. Don’t forget to match them with the rest of the Peter Rabbit party range. Thank Your Guests for Coming with These Peter Rabbit Party Bags!Give your guests some treats as the party comes to an end with these beautifully illustrated paper party bags, each one with an illustration of the cute, mischievous little bunny!They come with a cotton handle to help carry them too, ideal if you’re planning on stocking the guests up with party bag fillers and a big chunk of cake each! This delightful Peter Rabbit baby book is an ideal gift for parents to be!Each page documents one of your baby\'s first 18 months with spaces to add your photos and information of each milestone. 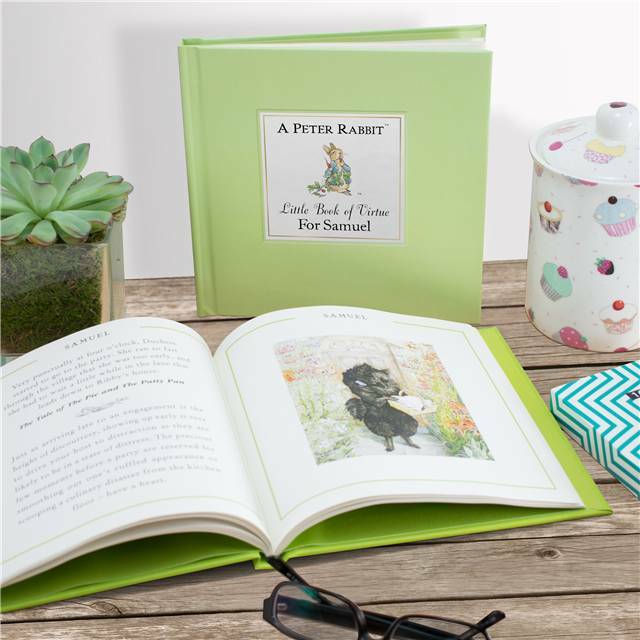 With a beautiful Paperchase exclusive Beatrix Potter illustration a padded cover and a turquoise ribbon closure it\'s the perfect keepsake that both you and your little one will cherish for years to come. The Nitty GrittyMeasures (approx) 230 x 20 x 230 mm. Night Night Peter Rabbit is the softest cosiest bedtime treat for sleepy babies. This delightful cloth book, based on some of Beatrix Potter's best-loved characters, includes two enticingly rustly pages that are sure to hold the attention of every wriggly baby! Get ready to CRUNCH some lettuce with Benjamin Bunny and RUSTLE through the leaves with Squirrel Nutkin. Other characters to meet include Peter Rabbit, Jemima Puddle-Duck, Tom Kitten, Mrs Tittlemouse and a sleepy Flopsy Bunny!Beatrix Potter's world-renowned classic artwork style, the softest fabric and a very smart presentation box all add up to the perfect gift for a new baby. Invite all your guests to your party with these Peter Rabbit cut-out invitations complete with co-ordinating stripy envelopes. 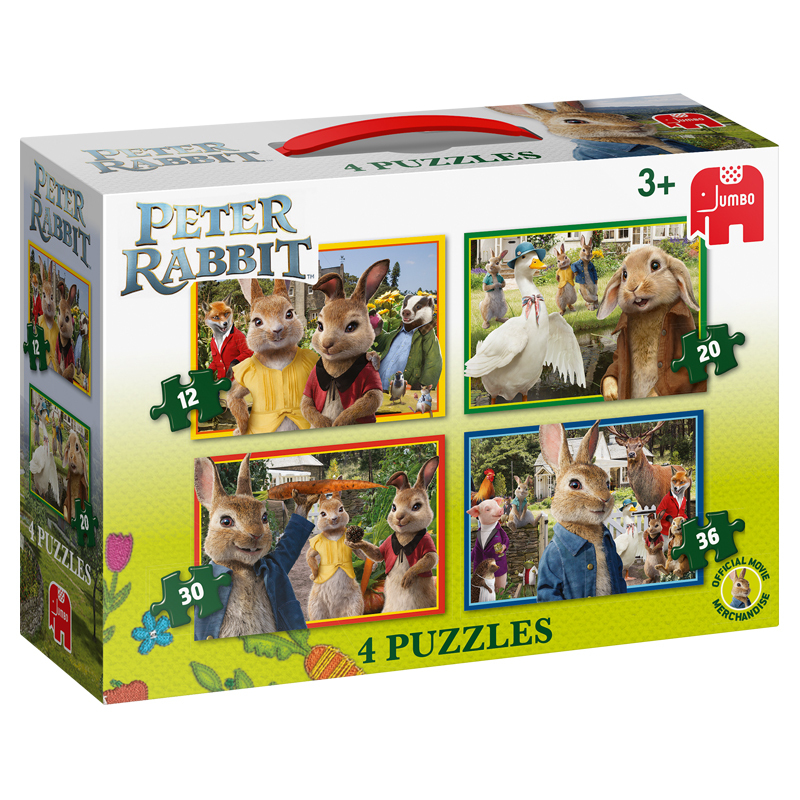 The Peter Rabbit 4 in 1 jigsaw puzzle box set includes a collection of four brightly coloured illustrations of the hugely popular characters from the Peter Rabbit film. The jigsaws increase in piece count from 12 to 20, 30 and 36 to help encourage, and develop young childrenâs skills. The illustrations feature Peter, Mopsy, Flops, Jemima Puddle-Duck, Benjamin Rabbit, Cotton-tail, Johnny Town Mouse, Mrs Tiggy-Winkle & Jeremy Fisher. All the finished jigsaw puzzles measure 23 x 16cm (approximately) when complete and have been produced using a high quality cardboard. Puzzling is a great way to help children develop their early problem solving, hand-eye coordination and fine motor skills. Track and record your little one\'s first year with this adorable set of Peter Rabbit baby\'s first moments cards. Featuring Peter his three sisters and other adorable characters from the stories the set includes 34 photo milestone cards ranging from \'Today I smiled for the first time\' to \'Today I giggled for the first time\' and \'My first Photo \'. A gorgeous gift for new parents. Each card measures (approx) 140x140mm. Decorate Your Food with These Sweet Vintage Peter Rabbit Party Picks!Perfect as cake toppers or for little dishes full of nibbles, these themed picks complete the Peter Rabbit party look! Each one is topped with an illustrated cut out of Peter Rabbit and his friends, and is made from a high-quality wood to prevent any splinters! Perfect if little hands get a hold!Match these picks with the rest of our Peter Rabbit range to complete the look! A beautiful large gift box featuring lovely little illustrations of Beatrix Potter\'s Peter Rabbit character popping out of a blue polka dot print. It\'s the perfect way to wrap a Christening new baby or little one\'s birthday present. Too cute for its own good!Matching roll wrap is also available.Measures (approx) 230x230x138mm. Made from paper from responsible sources. Keep track of your little bunny as they reach all the important milestones with this Peter Rabbit milestone chalkboard!With spaces for your baby\'s name date of birth age in months weight and more - you can fill in this board again and again and snap a photo to remember each of the important moments as they grow!The Nitty GrittyMeasures approx. 165 x 206 mm. A charming set of thank you cards featuring a blue polka dot design with Beatrix Potter\'s Peter Rabbit character popping out. These Thank You cards are exclusive to Paperchase and are ideal for occasions like children\'s birthdays new-born babies or baby showers.